You might call it training. Whatever the word, Meghan Markle begins her new life today as she closes the book on her TV acting career and starts work as a British Royal. Prince Harry is taking her to Nottingham – a city where he has spent a lot of time, both publicly and privately. It is the city he has chosen to introduce his financée to the British public. Meghan is no stranger to the UK, having been coming here frequently since she started dating Harry in July 2016. But she herself admitted in that engagement interview on Monday, that she wants to get to know the “different communities” which make up Britain. The 36-year old grew up in California and she’s most recently been living in Toronto in Canada where her drama series Suits is filmed. It means her connections to – and knowledge of - Britain are not exactly extensive. So, transitioning to be a member of the Royal Family starts here. Today, Prince Harry will take her to two projects very close to his heart: HIV/AIDS and youth crime. Their first visit will be at the Nottingham Contemporary in the city centre where the charity, the Terrence Higgins Trust, is holding a world AIDS Day fair. 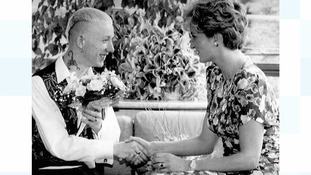 The Trust was also very special to Harry’s mother, Princess Diana, who broke down the stigma surrounding the disease in the 1980s and 1990s. The couple will then visit the Nottingham Academy school where the charity Full Effect, which is supported by the Royal Foundation trust, works to keep young people out of crime and violence in the St Ann’s area of the city. Meghan is no stranger to charity work. Whilst she was acting in Suits, she was also an advocate for UN Women and for the Canada charity World Vision – through which she spent time campaigning in Rwanda. But above all else, today will give members of the public the chance to meet the prince’s fiancée for the first time. It will not be a quiet affair. There is huge media interest in Meghan Markle, particularly from the press in her home country, America. She’s used to the cameras, of course – she was an actress until very recently. But she will find out today – just what it’s like being a British Royal and the focus of everyone’s attention.